The Chicago Bears had a disastrous 2014. 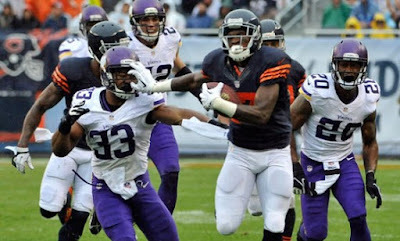 The club finished 5-11, dead last in the NFC North, along with turmoil surrounding the coach and QB. So, in 2015 the organization decided to make a change at Head Coach, replacing Marc Trestman with John Fox. Fox will run a more disciplined team, but do they have the players in place to be a winner in 2015? We aren't counting on it. We expect the Bears to struggle in 2015 and miss the playoffs again this year. The Bears offense scored poorly in 2014, and things likely will not be any different in 2015. QB Jay Cutler is expected to be a low end QB2, but Forte, Jeffery and Bennett are expected to be top 5-10 at their respective positions... Unfortunately, Chicago has a difficult schedule this season, with matchups against defenses like Seattle, Arizona, St. Louis, Denver, Kansas City, Green Bay x2, Minnesota x2, and San Diego, we don't see a great year coming from the Bears fantasy studs. The Bears Defense was brutally bad again in 2014, Giving up the 2nd most points and 3rd most yards allowed in the NFL. The team is changing from a 4-3 to 3-4 defense, and rebuilding the unit to fit the new scheme. IDP wise, the team looks to be on the field a lot, so you'll likely get good tackle numbers from the starters. This unit is not draftable as a DST in almost any format.